Those of you who follow me on twitter will know that I returned to London today and promptly froze upon my arrival at the train station. My totally adorable boyfriend even left me with his over washed Superdry hoody as I was shivering so much! It was so, so cold I was actually tempted to in my deliriously optimistic 'I have money' when I truly don't mind frame to purchase all three of the above coats and wear them all in order to acquire some warmth. 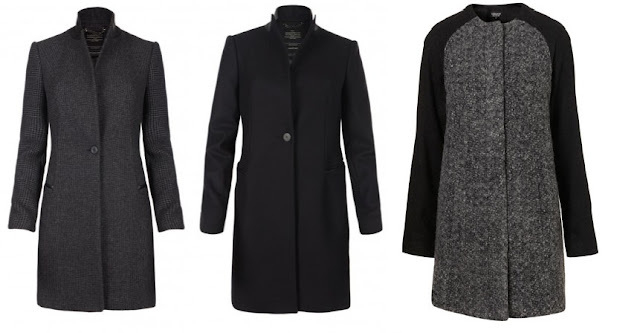 These are my three absolute favourite coats this winter so far. Each have huge pro's and huge con's. Coat 2, is also from All Saints and is the Aleggro Coat. It's the coat I was besotted with before the arrival of Tula. It is also a crombie coat: facilitating great versatility in wear. Made from Italian wool with an external dart detailing its the edgier of the two. Coat 3, is Topshop's Collarless Knit Swing Coat. Made from 80% wool it's a snug coat with gorgeous contrast raglin sleeves its inevitably going to be seen on at least two girls per tube carriage this winter, or next week if the weather deteriorates further. As with all Topshop garments the popularity and questionable quality really sway me away from this one and to spending slightly more (or less - if you're lucky enough to spot a bargain). The other two I loved are both from ZARA, but as with Topshop it's just too mainstream and I've already seen several girls wearing them. (This ONE and this ONE). Have you spotted any gorgeous coats about? What do you think to these? Are any of them worth the investment? I'm desperate to acquire a new one before LFW as the weather is so unpredictable. I love the Topshop one!